Horse Bleeding or EIPH (termed exercise induced-pulmonary- hemorrhage) occurs during strenuous exercise is common in racehorses. However, blood ( hemorrhage) appears at the nostrils (referred to as ‘epistaxis’) in only a small percentage of cases. InVictoria, the prevalence of horses bleeding for the first-time as defined as the appearance of blood at both nostrils after exercise is approximately 1.5 per 1000 starters (or 0.15%). This is comparable to that reported in Japan, Britain and South Africa, and less than that reported in Singapore, Hong Kong, and the USA. Although blood appearing at the nostrils is relatively uncommon, data from large surveys performed in a number of areas around the world indicate that some degree of EIPH may occur in up to 75% of runners. Blood may be present in the trachea alone and therefore may only be evident on endoscopic examination after exercise. As it may take some time for the normal clearance mechanism of the respiratory tract to move blood into the trachea from the lungs, endoscopy may not reveal hemorrhage unless it is performed 60 minutes or more after exercise. In some cases, EIPH is not evident on endoscopy and laboratory analysis of a bronchoalveolar lavage sample (BAL or ‘lung wash’) is necessary to demonstrate its occurrence. Why do horses bleed from their lungs? Although EIPH is common, we do not fully understand its cause. Proposed mechanisms include stress failure of the smallest vessels (the capillaries) in the lung, pulmonary fibrosis (preexisting scarring within the lung tissues) and small airway disease (inflammation triggered by viral infection or the inhalation of stable dust and other foreign particles). Currently, the most accepted theory is that of exercise-induced pulmonary hypertension resulting in alveolar capillary stress failure. The interface of the small air spaces (alveoli) and smallest blood vessels (capillaries) in the lungs has to be extremely thin to allow the exchange of respiratory gases (oxygen and carbon dioxide). Accumulating evidence suggests that EIPH is caused by mechanical failure of this barrier when the internal pressure rises to a very high level. When galloping, racehorses have a very high cardiac output that pushes blood through the pulmonary circulation. This creates very high pressure in the pulmonary capillaries whereby they may rupture releasing blood into the alveoli of the lung. Therefore to some extent, EIPH is an inevitable consequence (some might say physiological) of the extremely high cardiac output required by racehorses. Furthermore, the large negative inspiratory pressure in the airways that is created in order to achieve high airflow contributes to the pressure differences placed on the capillary walls. Any upper respiratory tract obstruction (such as laryngeal hemiplegia/‘roaring’) or airway disease in the lungs may, therefore, exacerbate the large negative pressure and potentially at least, contribute further to EIPH. Another hypothesis put forward as a contributing factor to EIPH may be an impact-induced injury to the lung caused by ground-strike pressures during galloping. These impacts produce pressure waves that are transmitted through the forelimbs, via the shoulder blades to the rib cage and lung. Although some studies suggest that EIPH occurs more frequently on harder tracks, other studies have not found this to be a risk factor. Further evidence that this phenomenon is unlikely to be central to the problem is the observation that horses can bleed when swimming, an exercise that quite obviously does not induce groundstrike impact. Very recent research proposes that increased pressure within the veins in lung tissue may result in veno-occlusive remodeling and narrowing of the lumen of the veins in a similar fashion to that which occurs in pulmonary veno-occlusive disease (PVOD) in humans. A better understanding of the cause of this important condition continues to be sought in the hope that it will lead to improved means of prevention of EIPH. Horses that bleed from the nose and ‘pull up’ in a race clearly have a reduction in performance. Indeed, most horses with blood at both nostrils finish worse than mid-field, and about half of these horses finish last. The effect of EIPH on performance is probably related to the volume of hemorrhage. A small amount of pulmonary hemorrhage may or may not significantly reduce performance, but a larger amount of bleeding can. The effects of bleeding are likely to be progressive and lung damage cumulative, ultimately leading to significant decreases in performance. This is likely because blood in the lung causes pulmonary inflammation (for at least three weeks following each episode), red cells are cleared slowly, and repeated bouts of exercise may result in repeated episodes of EIPH. Therefore, EIPH is a serious condition in racehorses and prevention or reduction of its incidence is an important issue. How many horses die as a result of bleeding? The answer is very few. A review of causes of death in horses at several centers in Australia and the USA reveals that less than 2% of deaths are due to severe EIPH (‘bleeding’), a small percentage is due to cardiovascular disease, whereas the majority of fatalities are as a result of serious musculoskeletal (mainly leg) injury. Between mid-1999-2005, 6 horses collapsed and died during racing in Singapore for reasons other than musculoskeletal injury. Of these, necropsy examination confirmed 3 horses to have died due to severe EIPH (i.e. 3 cases in over 30,000 runners during this period), one due to heart failure, one due to rupture of a major internal vessel, and in one case, the causes could not be determined. Furthermore, we can consider that of the 218 bleeders reported after racing during this same period, only 3 died. Horses that suffer a severe or fatal bleed during exercise typically weaken and stumble before they ‘pull up’ or collapse usually allowing time for the jockey to jump off in many cases. Serious injuries to riders are more likely to be associated with catastrophic musculoskeletal injuries and other accidents when a horse falls or veers suddenly and unexpectedly. From no or limited action to banning horses from racing after the second episode. Although individuals may differ slightly in their opinions, overall, the parties concerned (trainers, owners, jockeys, vets and stewards) seem generally satisfied with the current rules. The pre-race administration of frusemide (‘lasix’) is permitted in some states in the USA but not elsewhere. Although trainers may want frusemide permitted, there are important reasons why it is not. In the United Kingdom, there are no specific rules relating to horses exhibiting blood at the nostrils after exercise. From a regulatory perspective, each occurrence is dealt with on a case by case basis. In many jurisdictions, the problem tends to be self-regulating, with many trainers voluntarily retiring most horses that repeatedly bleed. However, this does not obviate the need for regulation. The Rules of Racing in Australia are designed to significantly protect the health and welfare of both horses and jockeys. In California, the administration of frusemide (‘lasix’ is permitted for horses on the ‘bleeder list’ (a list of horses reported to have blood at the nostrils or in the trachea on endoscopic examination after racing or training). If the horse is observed by officials to have bled from one or both nostrils after exercise or post-race, the following restrictions from racing 180 days; 4th episode-banned from competition for life. In South Africa the rule stipulates: 1st episode-banned from racing for 3 months; 2nd episode-banned from racing for 6 months; 3rd episode banned for life. Under the Rules of the Malayan Racing Association (which includes Singapore), a horse declared a ‘bleeder’ must not be cantered or galloped on the main training tracks for 2 months, or start in any race for 3 months, and only then after completing a 1000m trials gallop with bleeding. If the horse then races 3 times without bleeding it will revert to non-bleeder status. If the horse does bleed again before achieving this, it must not be cantered or galloped on the main training tracks for 2 months or start in a race for 6 months, and only then after completing a 1000m trial gallop without bleeding. Again, if the horse then races 3 times without bleeding it will revert to non-bleeder status. The horse is permanently banned if it suffers a 3rd bleeding attack without having reverted to non-bleeder status.The regulations for bleeders are stricter in Australia, New Zealand and Hong Kong. 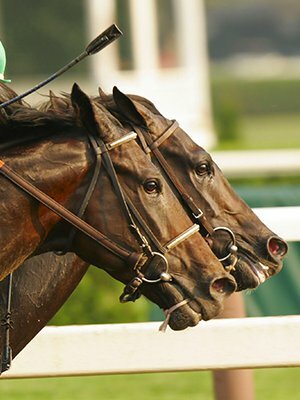 In Australia and NZ, horses reported by officials to have blood in both nostrils (unless in the opinion of the Stewards such bleeding was caused by external trauma) may not be exercised on any racecourse for 2 months or start in any race for 3 months, and only then after a satisfactory gallop of at least 1,000m in the presence of a Steward. If the horse bleeds on a second occasion, it is banned for life. In Hong Kong, a bleeder is defined as a horse with pulmonary hemorrhage evident at one or both nostrils and the rule states 1st episode-banned from the training track for 2 months and from racing for 3 months and only after passing a barrier trial; 2nd episode-banned for life. Can bleeding be prevented or managed? Because hemorrhage into the lung can create severe and continuing pathological reactions, it is well worthwhile investigating possible predisposing causes of the EIPH in any individual horse and, to implement strategies to reduce the occurrence and severity of this condition where possible. There are currently no methods and treatments which directly prevent the occurrence of EIPH, however, certain treatments and management strategies can assist in reducing the severity of hemorrhage and therefore reduce the ongoing repetitive lung damage. Any underlying inflammatory airway disease (IAD) should be diagnosed in the first instance, treated and managed appropriately thereafter. This usually requires a collection of a ‘lung wash’ (BAL), which is probably best performed several weeks after the bleeding episode. Ideally, treatment includes management of the damage already present in the lung by providing the lungs with sufficient time to clear blood and to heal. A minimum time of 1 month is likely to be needed to recover from a single acute episode of EIPH. A longer period is required in many cases where chronic lesions are present. Despite months of rest and treatment, some horses do continue to bleed when faster exercise resumes. These horses should be and usually are retired. Management of horses with EIPH is aimed at reducing bleeding. Frusemide (‘Lasix’) used before strenuous exercise may decrease the severity of EIPH, but it does not prevent it from occurring. When given 90min to 4 hr before exercise, this diuretic drug produces a decrease in pressures within the blood vessels in the lung. Because of its diuretic effect, horses treated with this drug lose significant amounts of water, weigh less and may race faster. For this reason, together with the unwanted effects on detection of other drugs and, the fact that frusemide is not effective in preventing EIPH, most racing authorities do not allow the use of this drug prior to racing. *Ensuring good stable management practices. (BAL is often required to do this) and treating this condition appropriately. Depending on the circumstances and diagnosis in each case, therapy with appropriate corticosteroids and/or bronchodilators amongst other things may be prescribed by the veterinarian to treat the underlying condition. • Diagnosing and treating any conditions causing upper respiratory tract obstruction (such as dorsal displacement of the soft palate). • Ideally, resting horses for an appropriate period of time following an episode of EIPH to provide the opportunity for blood to clear and the lungs to heal. This article was prepared by Dr. Cate Steel, BVSc FACVSc. 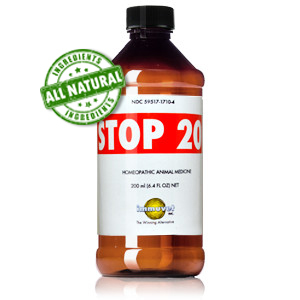 STOP 20 is recommended for all high performance horses (race horses, trotters, pacers, polo ponies, show jumpers, rodeo performing cattle horses, etc.) that exhibit performance deficit associated with EIPH. Stop 20 AM&PM™ is a carefully developed product designed to reduce the incidence and severity of Exercise Induced Pulmonary Hemorrhage (EIPH), commonly known as Bleeding, in performance horses. 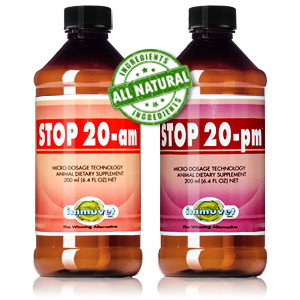 STOP 20 AM&PM™ is recommended for all high performance horses (race horses, trotters, pacers, polo ponies, show jumpers, rodeo performing cattle horses, etc.) that exhibit performance deficit associated with EIPH.